REDUX REVIEW: Fruition kindly sent some new releases -- Marcona Almonds & Butter Butter Bourbon Caramels, reviewed at the beginning of the Selections section below. Demonstrative that this rising label intends to really hone & home in on combinational cuisine chemistry. ********************************************* Bryan Graham, the talent behind this boxed assortment, so intuitively understands how to avoid the C-spot's™ List of Banned Words that he almost singlehandedly inspires its opposite: holy scripture of cacáo. The first term among its hallowed entries: Fruition. A platinum word if there ever was one to join others like: bliss - symphonic - courage - confabulation - euphoria - delirium - climax - chaos- revolution - lustful - thunder - sensuous - compassion - love &, of course, chocolate itself. Chocolate... the treat of all sweets, derived from the fruit-bearing tree Theobroma cacáo (aka, to add one more to the list of sacred script, "nectar of the gods"). Fruition just sounds & rounds well before rolling off the tongue -- frü' i-shən. Sonically significant too... whether in the lingua franca -- English -- or globish or any language. On top of that it looks vital in its Roman alphabet letters. It embodies the hopes & dreams of both Graham's small craft chocolate & humanity's greatest aspirations. For its meaning is all about the evolution of a seed into its fullest expression... its succulent sweet-spot... a process all living creatures undergo if they are to realize their potential. How much more fruitful can it get? A startup with pedigree & chops to start... from an exec pastry chef, ex Bear Café near Woodstock, NY. Most pastry chefs amount to no more than butter 'n flour kings with a ego for a crown. They traffic in recipes & re-melt someone else's chocolate before affixing their name on the box. 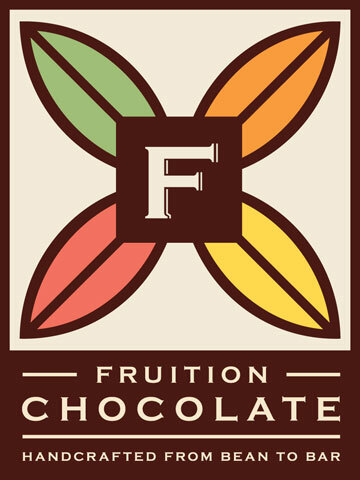 Fruition reps the new breed of bean-to-box (& the bombones within) which, come to think of it, trumps mere barsmiths. By taking the art one step beyond in the transformation of cacáo into chocolate at its, arguably, fullest expression, it elaborates the chemistry of manifold ingredients in a multi-dimensional way. So while most barsmiths play checkers, Bryan Graham sets out to master chess. A boxed assortment currently in development; the guy's just a little more than soul-coughing at the moment spitting out these considerable bon bons. Wait 'til he gets his seed selection, production, plus technique down pat & really hits his stroke. Pumpkin Pie - crystal sugar interplay with a cream fondant center high on the spice factors, especially nutmeg, to over-run the rest of the elements which only catch up at the meltaway point... where one question lingers: where's the pumpkin?